(September 13, 2017) Season 10 of the top-rated Emmy and Peabody award-winning CNN Original Series Anthony Bourdain Parts Unknown begins on Sunday, October 1 at 9pm ET/PT with a trip to Singapore. The eight-episode season also features tours of the French Alps, Puerto Rico, Lagos, Nigeria, Seattle, Sri Lanka, Pittsburgh, and southern Italy. Airing just prior to the season premiere, on October 1 at 8pm ET/PT, is Prime Cuts: Through The Seasons in which series executive producer Chris Collins asks Bourdain to reflect upon the 10 seasons of Parts Unknown. Anthony Bourdain Parts Unknown follows the world-renowned chef and best-selling author as he travels the globe to uncover the little-known, off-the-road, and sometimes seemingly-familiar areas of the world in a celebration of their diverse foods and culture. Singapore (season 10 premiere – airdate: October 1) Bourdain tours the historically rich streets of Singapore and immerses himself in the vast array of multicultural foods found throughout this island city-state. An old-school style prawn mee lunch with his go-to Singaporean food guide, KF Seetoh, and a trip down to the Muslim quarter for a soup-like dish of wontons, rice cake, coconut gravy, vegetables, and hard boiled eggs are included in the host’s cuisine-driven excursion. Bourdain also explores the dichotomy of Singapore society that is known for its tolerance of diverse cultures, generous social services, and sanctioned diversions (ex. legalized brothels, casinos), and the restriction of such basic civil liberties as freedom of the press and privacy. French Alps (airdate: October 8) The gloves are off and the rivalry continues as Bourdain and his long time friend, three-Michelin-starred chef Eric Ripert, embark on a ski-and-cheese-filled journey through the French Alps – home advantage Ripert? Bourdain gets a glimpse into Ripert’s early life while tending a little too closely to cows, and overindulging in delicious cheese dishes. The pair team up to prepare a French meal, featuring caviar and steak au poivre, with the help of Ripert’s mentor Maurice Guillouet. Bourdain and Ripert also venture across the Italian border to La Maison Rose and surrender to Bourdain’s love of pasta with gnocchi, ravioli, and polenta. Lagos, Nigeria (airdate: October 15) Once considered the most dangerous city in the world, Lagos is, in many ways, the epicenter of modern Africa. The driving force of the city is a pervasive, almost pathologically positive outlook, a sincerely entrenched “can do” spirit. The ingenuity of the Nigerian people is the focus of Bourdain’s travels as he explores its food, music, and rich cultural diversity. Among the food offerings are fresh fish dishes, spicy soups, a great deal of beef, and the ubiquitous pounded yam. Bourdain also spends time with Femi, Seun and Yeni Kuti, the children of Fela Kuti, a family that is still at the heart of Lagos’ creative, political and cultural scene. Sri Lanka (airdate: October 29) As peace spreads throughout Sri Lanka following the end of its brutal civil war, Bourdain travels to the once divided nation to experience the reinvigorated people, food and landscapes. Starting in Colombo, the country’s capital, Bourdain discovers change in in a place he visited nearly a decade ago as he enjoys street food on The Galle Face Green, dining on light curries and lots of seafood. 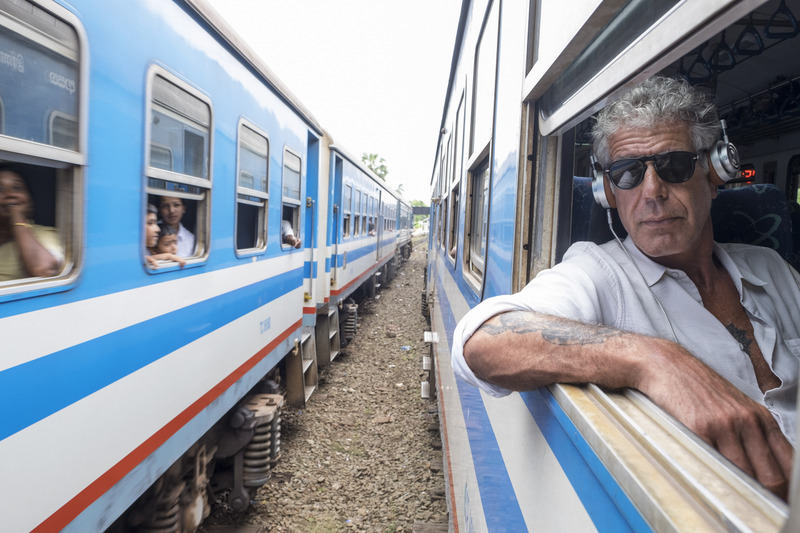 Taking a 10-hour train to the northern “time capsule” city of Jaffna, Bourdain experiences crab curry, a dish he calls the “holy grail of Sri Lankan cuisine,” for its spicy and fiery flavors. Puerto Rico (airdate: November 5) When Bourdain heads to Puerto Rico to check out the reality behind the piña coladas and fancy resorts, he finds natural splendor, delicious food and warm people, all against the background of a seemingly insurmountable economic crisis. Bourdain also learns why Puerto Ricans are so devoted to their homeland, and so determined to stay there. He samples ‘grandma food’ at a restaurant that evokes a simple traditional Puerto Rican home, cracks open the freshest crabs at a rustic spot on the beach, joins singer Tito Auger for a meal with friends and enjoys some of the best lechon (roast pork) around. A trip to the small island of Vieques rounds out his experience, with a meal at a sustainable farm and an optimistic discussion about strategies for a better future for the region and its people. Seattle (airdate: November 19) Bourdain immerses himself in the “boom or bust” city of Seattle. Two industries are reshaping the city and its culture – tech and the newly legalized cannabis industry. Bourdain gets the skinny on the “tech bro” invasion of Capitol Hill, throws back a dozen succulent oysters at the Taylor Shellfish Company and enjoys fish & chips at the Pacific Inn Pub with band members of The Gods Themselves. Along the way, he also hangs out with legendary Seattle rocker, Mark Lanegan and mad food scientist, Nathan Myhrvold. Southern Italy (airdate: November 26) The“Heel of the Boot” draws Bourdain back in time as he visits the largely untouched landscapes and colorful locals of Southern Italy and a culture steeped in both Christian and Pagan traditions. Unlike any other part of Italy, locals here perform a Taranta dance and speak the ancient language of “Grieco.” The local cuisine of the Southern Italy is showcased during a meal with Italian-American film director Francis Ford Coppola at his hotel, Palazzo Margherita, where Bourdain is served traditional dishes of the Basilicata region like ‘Pecora Pastorale,’ a Summer preparation of mutton and herbs. Parts Unknown enthusiasts can recreate Bourdain’s journeys and find archived material from past seasons via Explore Parts Unknown, a partnership of CNN, Roads & Kingdoms, and Anthony Bourdain. This mobile-first, digital exclusive destination, reflects the style and editorial focus born from the host’s contagious passion for culture, food, travel, and adventure. Original stories, recipes, perfect day destinations, hotel bar diaries, premium photography, engaging interactives, and digital-exclusive video are featured. New destinations roll out every week. Viewers are encouraged to follow the show’s Twitter account @partsunknownCNN (twitter.com/PartsUnknownCNN) and the CNN Parts Unknown Facebook page (facebook.com/PartsUnknownCNN). Each episode of Anthony Bourdain Parts Unknown will be available On Demand the day after the broadcast premiere on cable VOD, CNN mobile app, and on CNNgo via Roku, AppleTV, Amazon Fire, Samsung TV, Android TV and desktop at www.cnn.com/go. Zero Point Zero Production, Inc. is a television, film and digital media company founded in 2003 by Chris Collins and Lydia Tenaglia, with partner and Managing Director Joe Caterini joining in 2009. Since its inception, the company has produced hundreds of hours of television in over 100 countries around the world, including the critically acclaimed, Emmy & Peabody Award winning series, Anthony Bourdain: Parts Unknown (CNN); the Emmy Award winning The Mind of a Chef (PBS) and Emmy nominated The Hunt with John Walsh (HLN).